When the PyCharm IDE crashes and I use the "phone home" feature to automatically send a stack trace and submit an issue/incident, how can external users (i.e. non-JetBrains folks) track the status of that reported issue? Today I've had quite a bit of bad luck, experiencing 3 (or was it 4?) crashes under RC1. Each crash I opted to do the automatic submit. However, I have been unable to find an issues "reported by me" that were submitted earlier today. 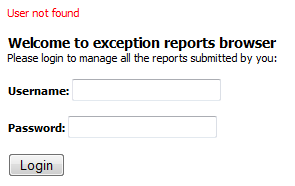 All these reports are send to our exception analyzer facility, which has no integration with youtrack yet. Because of this you don't see any issues reported by you, however these reports are constantly monitored. Is there any mechanism where by JetBrains can advise me of when a new build is available that specifically targets fixes for those issue(s) I reported? Some colleagues of mine and I are currently evaluating Python-aware IDEs. Up until the recent stability issues, PyCharm was received quite favorably and on the list of final contenders. I'm also curious about this, and wondering if I should roll back to beta2 in the meantime. At the moment we don't have any facility for sending notifications when an exception reported by you is fixed. I get a "user not found" error when visiting that page, although my login does work for account.jetbrains.com. Just like Kevin noted above, I too get a User Not Found error when attempting to sign in to http://ea.jetbrains.com/browser/ --- see attached screen shot. I've tried both my JetBrain's Discussion and YouTrack uid/pwd combos, but had no luck. Mine works, so this does not affect all users. Since access to http://ea.jetbrains.com/browser/ still does not work for me, any chance someone at JetBriains can confirm whether 1.0 RC2 addresses the stability issues I previously reported in 1.0 RC1 ? Interestingly, I did see those stability issues in Beta 2 (96.1203). I checked the 1.0 RC2 release notes, but did not see anything that stood out. We don't include information about fixed exceptions in release notes, however I can say that the most common reported exceptions in RC1 were fixed in RC2. Good news --- the stability issues I saw with RC1 appear to be resolved in RC2. In RC1 (but not beta 2) I was able to reliably crash the IDE consistently within 5 minutes of usage --- typically after adding a new function and then editting the function's block of code thereafter. In RC2, things keep on humming along. Well done and thanks for getting that exception fixed.